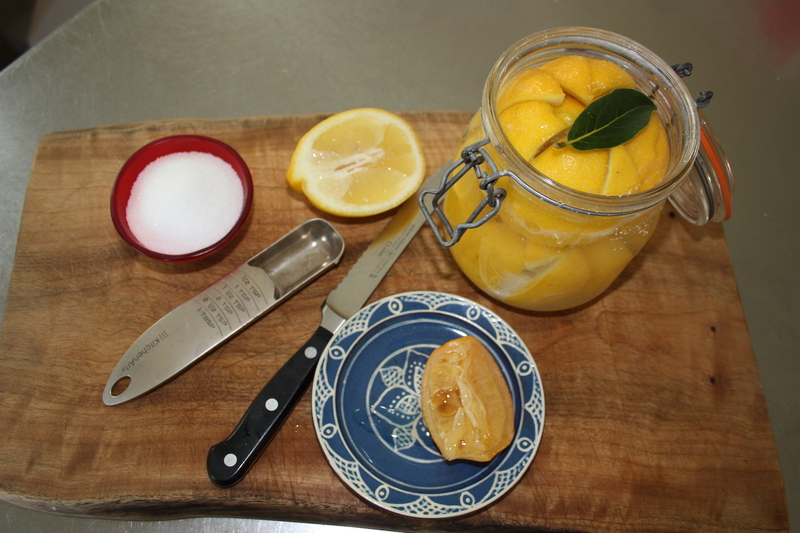 Preserved lemons: their beautiful colour and flavour enhance every dish they are added to. I use it in meat dishes to give a Middle Eastern and Moroccan flavour particularly to chicken and lamb. I add it to couscous, bulgar and quinoa salads and roasted vegetables. How could I let myself use all my preserved lemons without preparing another batch? I had been waiting of course to try to get unwaxed lemons from my local market or from my trees but the timing hasn’t been right. It doesn’t take long to make a batch and it is so satisfying every time I open the fridge to see the squat bottle filled to the brim with beautiful jewel coloured lemons pickling in the salted water. I am collecting my recipes that use preserved lemon in anticipation. Select a wide-mouthed jar to make it easier to push the lemons into. I use a Kilner jar. Sterilise the jar by boiling it in a large saucepan of water for a few minutes. Drain and allow to cool. Wash the lemons in warm water to assist in removing any wax. Cut the lemons into quarters almost to, but not completely to the bottom of the fruit. Pour a spoonful of salt into the lemons and squash it into the jar, keeping upright to retain as much salt as possible in the fruit. Continue to do this packing in the lemons as tightly as possible into the jar. If you can keep the lemons whole they look better, but you can also add halves and quarters to fill the spaces in the jar. Don’t worry if the salt spills out into the jar. Once the jar is full of lemons, fill the spaces with either water or if you have lemon juice left over from another recipe, add that as well. Try to remove all the air pockets. I add a bay leaf to the top of the jar for colour and flavour. You can also add coriander seeds for additional flavour. Close the jar tightly and leave undisturbed for at least a month. To use: Remove the lemon from the jar, scoop out the flesh and discard. Rinse the rind and then slice or chop it according to the recipe that you are making. Bon appetite! This entry was posted in Food, Preserving and tagged preserved lemons on November 7, 2014 by lorikeetlady.